This is the official licensed 8:10 scale replica of the Ferrari 488 GTB racing wheel by Thrustmaster! It's designed to provide total realism in all PlayStation 4 racing games that support wheels and is also compatible with PC (Windows 10/8/7). The Thrustmaster T80 Ferrari 488 GTB edition for PS4 + PC comes with a large 2-pedal pedal set with adjustable angle of inclination and wide foot-rest for ultra-precise, comfortable acceleration and braking. The T80 Ferrari 488 GTB Edition is an 8:10 scale replica of the Ferrari 488 GTB wheel (11”/28 cm in diameter), officially licensed by Ferrari and PlayStation 4. The wheel features official buttons for PlayStation 4 ("PS", "SHARE" and "OPTIONS") for easy navigation within the PlayStation 4 interface and in menus of PlayStation 4 games. Compatible with all PlayStation 4 systems, PS4 racing games supporting wheels, and on PC (Windows 7/8/10). Optimized “Bungee Cord” mechanism (automatic re-centering system patented by Thrustmaster): delivers linear resistance, regardless of the rotation angle, ensuring ergonomic and intuitive control. Automatic centering and 240 degree rotation angle. 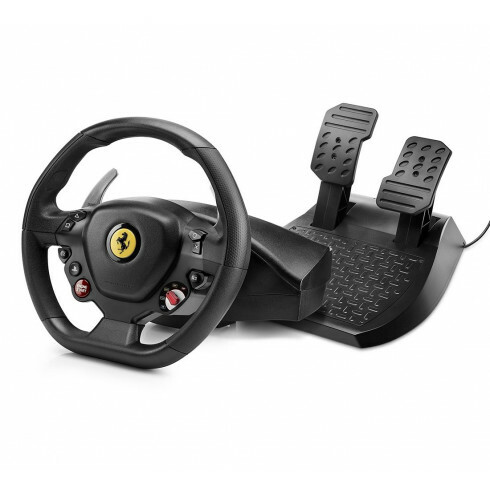 The T80 Ferrari 488 GTB Edition racing wheel combines great comfort with comprehensive equipment. The device's 11”/28 cm diameter wheel and textured rubber cladding offer superior grip surfaces – a feature that all players will enjoy during long racing sessions. The racing wheel is also equipped with 11 action buttons and a D-pad, plus 2 large, metal wheel-mounted sequential paddle shifters. Also included is a large pedal set with adjustable angle of inclination and a wide foot-rest for ultra-precise, comfortable acceleration and braking.